Walter Giles was born in Quorn in 1888. During WW1 he was a signaller and fought in the Gallipoli campaign. 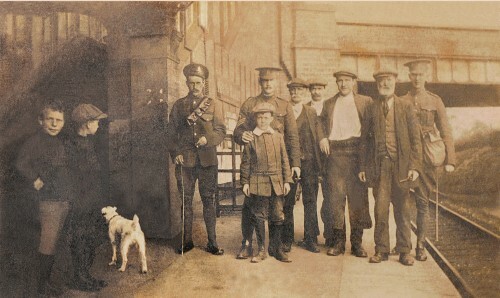 This exceptional photograph shows Walter on Quorn Station, leaving home to go to war. Walter is standing in uniform, on the left, by the pillar, with a bandolier of ammunition across his chest. The man third from the right, looks as if he may have been a blacksmith, as he seems to be wearing leather apron, which is open in the the middle, which would allow him to hold a horse's leg. Walter Giles survived the war and died in 1973. Missing information: Can you identify anyone else in this photograph?